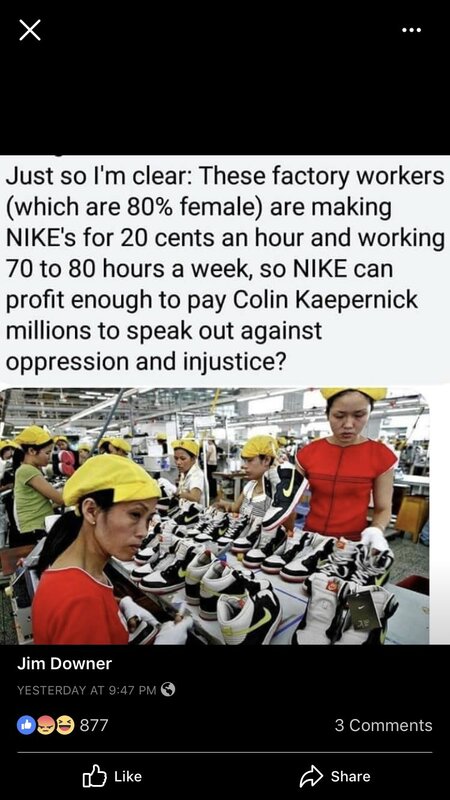 This entry was posted in Culture War, Liberals/Democrats/Left, Media, Military, NFL take a knee, Race, race baiters/profiteers, social justice warriors/SJW, United States and tagged #bluelivesmatter, #boycottnike, #NikeBoycott, Arlington National Cemetery, Big Brother/Big Sister, Boys and Girls Club, Colin Kaepernick, Just Do It, National Association of Police Organizations, National Law Enforcement Officer's Memorial, NFL, Nike, Police Athletic Leagues, SF 49ers. Bookmark the permalink. Wow–just Saturday my husband passed up a $50 pair of Nike sliders..good thing for us; bad thing for Nike. K-Mart, Target, Walmart, they may not be the best but boy you can walk, run, kick, throw in the wash. mac. and they are just as good, is not the brand but the person wearing them. Look at their disregard for their stock holders. Billions lost immediately. Brilliant move Nike, cough cough, you hire a guy, paying him millions. that spends his time crying he is fighting social injustice while paying your workers 20 centers an hour. Makes both of you hypocrites. Maybe someone could ask them about this? Online sales of Nike apparel and shoes surged 27% in the four days after quarterback-turned-activist Colin Kaepernick became the face of a new advertising campaign. Sales dipped in the same four-day period last year. Don’t believe it, live just outside of Tombstone, Arizona and have never seen any carrying a gun. Think this is BS, sounds like the rancher wants a new fence for free.